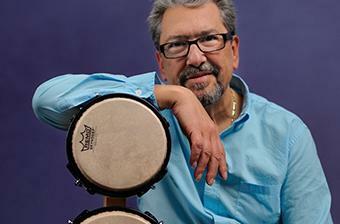 Luis Conte has created an extensive repository of world percussion lessons. Students in the percussion course have unlimited access to a collection of guided, high quality percussion lessons and an extensive library of play-along tracks. This lesson library contains everything you need to improve your percussion skills. You'll receive top quality latin percussion lessons from beginner to advanced skill levels. Learn at your own pace and connect with a worldwide community of music lovers to discuss your progress. This is the only place online to access percussion mastery of this level. Grammy®-winning Cuban musician Luis Conte is one of the most respected and prolific percussionists in contemporary music. Known for flawless technique and an unparalleled ability to seamlessly incorporate Latin percussion and world drumming into popular music, Conte’s resume includes Madonna, James Taylor, Phil Collins, Eric Clapton and Ray Charles among many others. He is a master of percussion instruments such as the cajon, congas, timbales, bongos, clave, cowbell, shakers, maracas, pandeiros, and guiro. In addition to Latin and World rhythms, Luis teaches Hip-Hop, Electronica, Jazz, Reggae and many other styles. ArtistWorks opened the world percussion lesson library in 2012.